1. Open the First Derm app. 2. Take an over view focused image of the chosen spot to photograph with the smartphone camera (no HÜD image). 3. 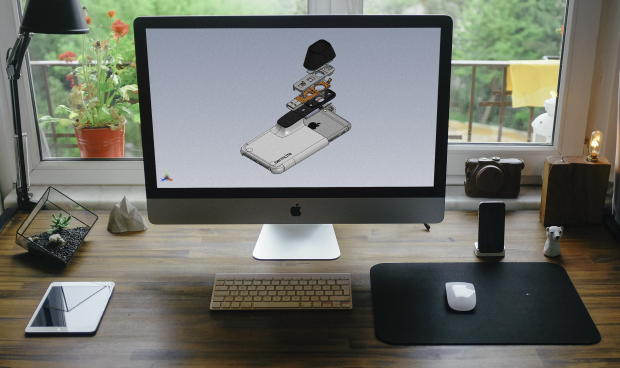 Slide the HÜD’s case onto your smartphone. 4. Turn on the LED. 5. Lightly moisten the spot to be photographed and its surrounding skin with hand sanitizer or similar liquid. This increases the translucency of the skin and improves the quality of the image. 6. Place HÜD directly on your mole and take a picture. 7. Store your medical-grade HÜD images for tracking, share with your healthcare provider, or use First Derm. The best thing to happen to skin since sunscreen. HÜD is Swedish for skin. It is the latest and greatest tool in the fight against skin cancer. HÜD is a medical-grade lens that attaches to any smartphone camera, allowing you to take crystal-clear images of the moles on your skin.  The accompanying First Derm app will teach you the skin cancer warning signs, remind you track your spots over time and enable you to share your HÜD images with a dermatologist for evaluation. The fight against skin cancer begins with you. 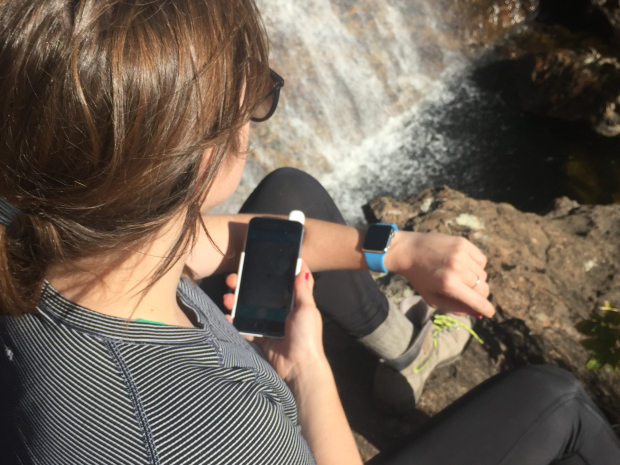 Check you and your loved ones’ spots – HÜD will be your guide. Skin cancer affects us all. The fact is that all moles should be considered dangerous until proven otherwise.1 in 5 Americans will develop skin cancer in their lifetimes, resulting in the death of over 12,000 people every year. Skin cancer isn’t just a problem for the elderly or fair-skinned, all ages and skin tones are susceptible. But there’s hope. Up to 95% of skin cancer deaths are preventable if they’re detected early. HÜD makes self-screening easy and accurate. Imagine you notice two spots on a loved one’s arm. What’s your next move? If you said, “ignore ‘em,” our team would have to sound the alarm and respectfully suggest otherwise! You know getting those moles checked by a dermatologist is the best idea, so you add making an appointment to your to-do list…someday. Even for those who regularly see a dermatologist, that next checkup might be months away. There’s a better way… HÜD! Take a picture of each mole with HÜD attached to your smartphone. The First Derm app will prompt you to enter relevant risk factors, such as changing shape or history of skin cancer. Your information is sent securely to a board-certified dermatologist who is trained to identify dangerous moles from the less threatening. 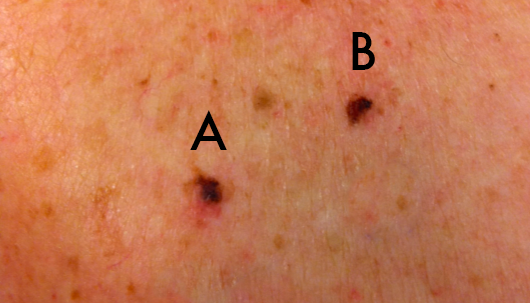 Using HÜD images, a First Derm dermatologist identifies mole A as a Senile Wart, which is not concerning. 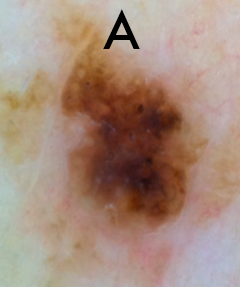 Mole B; however, is a “Dysplastic nevus with grave atopi”, the doctor advises that if this mole changes, you should come in for an immediate biopsy. You now have the information you need to make the correct choices about your moles. We are team First Derm, the leading mobile dermatology service. 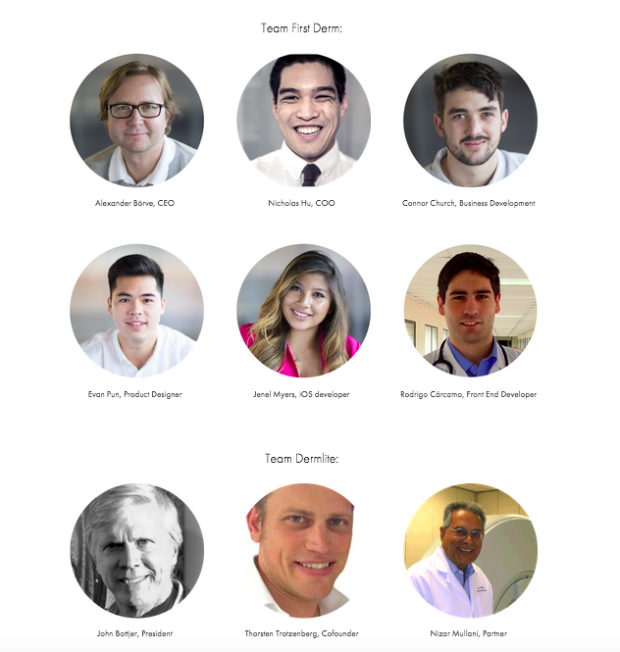 First Derm is small team of doctors, engineers, mobile health designers, researchers and statisticians. Through our app, our board-certified dermatologists have already helped over 15,000 people get answers about their skin rashes. With our software and network of dermatologists we knew there had to be a way for us to address the thousands of preventable skin cancer deaths per year. There is a great tool already out there for early detection of skin cancer called a dermatoscope, a specialized lens that helps a dermatologist tell if a mole is cancerous or benign. Unfortunately they’re not made for consumer use or budgets. That’s why we teamed up with Dermlite, the premiere manufacturer of dermatoscopes. Since 2014, we’ve worked together to develop HÜD. We share the mission of ending preventable skin cancer deaths with a mobile approach designed for home use. The idea behind HÜD was not thought up overnight in the garage, it’s the result of nearly 7 years of research, user testing and validation by First Derm and Dermlite. 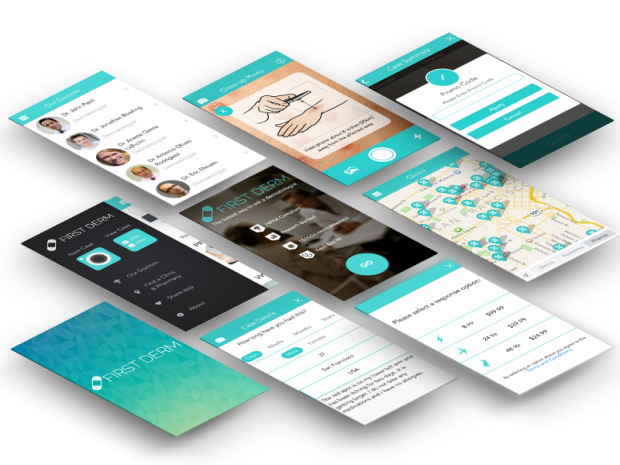 In 2009, First Derm founder ran a pilot study in Sweden illustrated the convenience of an app to provide medical information services through a mobile device. Physicians themselves used the app, took pictures of skin ailments, then sent them securely to a dermatologist. 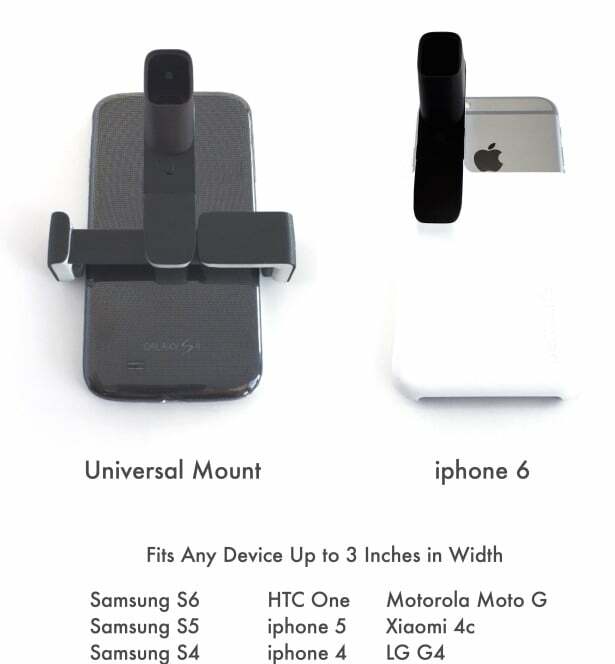 This was followed up by a 2013 study, “Mobile teledermoscopy- there is an app for that!”. This study affirmed the accuracy of mobile dermatoscope images for evaluating suspected skin cancers. Read more about First Derm research here. With diagnostic accuracy comparable to face-to-face visits with a dermatologist for suspected skin cancer lesions, mobile dermoscopy offers the patient less time waiting for a risk evaluation for a mole or skin lesion. The key here? Less time spent waiting means decreasing the risk that a potential cancer grows deeper into the skin. 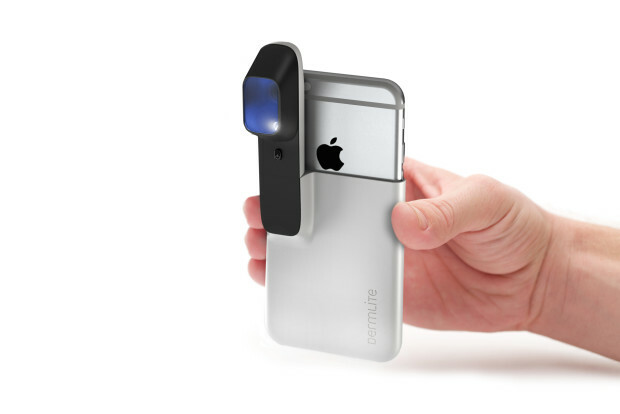 We knew we were on to something, so in 2014 we teamed up with Dermlite and hit the road with mobile dermatoscope. Armed with this proven technology, which we renamed HÜD, we started doing mobile skin cancer screenings in cities and countries across the globe. We’re happy to report that it works! Through our Spot Cancer campaigns, we’ve screened thousands of moles and detected over 20 deadly melanomas which might have otherwise gone unnoticed. Our #SpotCancer campaign in action. We will ship HÜD worldwide from California. Shipping within the continental US starts at $5 and international shipments at $35. 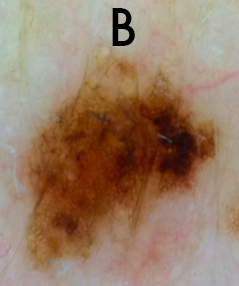 How can a doctor tell if a mole is cancerous with HÜD? Mobile dermoscopy is a proven method that has years of research behind it (see the story above). Doctors are able to tell with a high degree of certainty if a mole is worrisome. 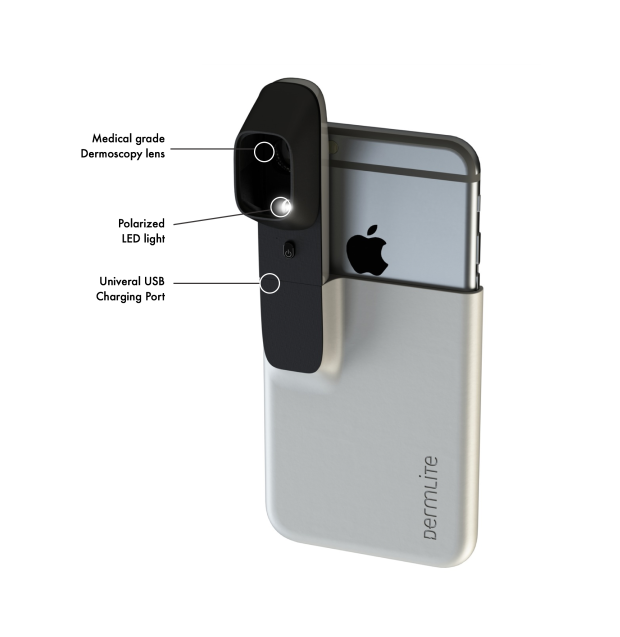 HÜD is making the dermoscope affordable and putting it in the hands of the public. Does HÜD work for other skin conditions? 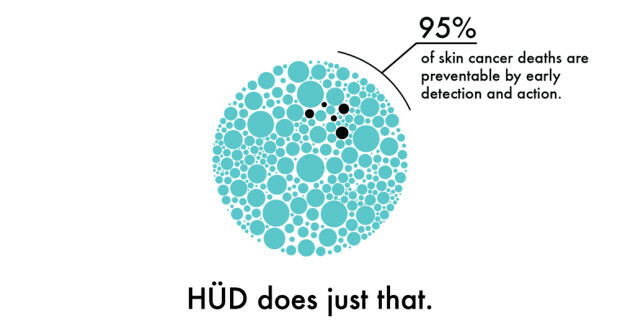 HÜD is not necessary for anything other than moles and potential skin cancer lesions. if you have a concerning rash or another lump or bump? Go ahead and use the First Derm mobile app for an opinion on any other skin concern. The utilizes your phone’s camera and you’ll hear back from one of our board-certified dermatologists in less than 24 hours. Who are the doctors looking at HÜD mole pictures? First Derm’s highly trained board-certified dermatologists are from the United States and Europe. Additionally, each dermatologist has advanced training in evaluating skin lesions with images taken with dermatoscopes like HÜD and they are also reviewed by First Derm medical board. Will HÜD work with my device? HÜD comes with a molded plastic iPhone 6 case. We will also ship the units with a universal adaptor which will allow the HÜD to attach to devices up to 3 inches in width. The app that powers HÜD is called First Derm and is available in 5 languages (English, Spanish, French, Italian, and Swedish) globally on iOS and Android. Let’s get HÜD out there! You will be on the front lines in the fight against skin cancer. 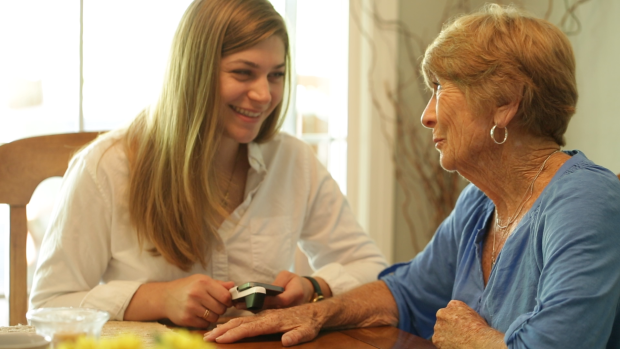 Our vision is to add this lifesaving technology to the arsenal of medical tools we keep in the home. Thermometers for temperature, glucometers for blood sugar, and HÜD for moles. With HÜD in hand, you are empowered to take control of your skin health. By tracking moles at home, you can potentially save you or your loved one’s life.